Cosmetic Surgeons have come to understand that augmenting the lower lids with fat is an important part of aesthetic lower lid blepharoplasty. 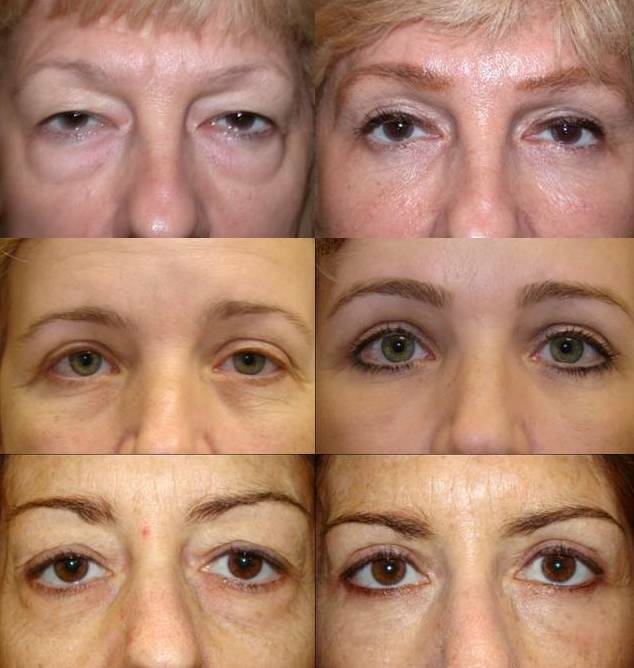 Often time’s traditional lower lid blepharoplasty has led to a sunken or hollowed appearance with a characteristic depression at the lid/cheek junction (what is often referred to as dark circles). This leads to a tired and aged appearance – not to a restoration of youth. 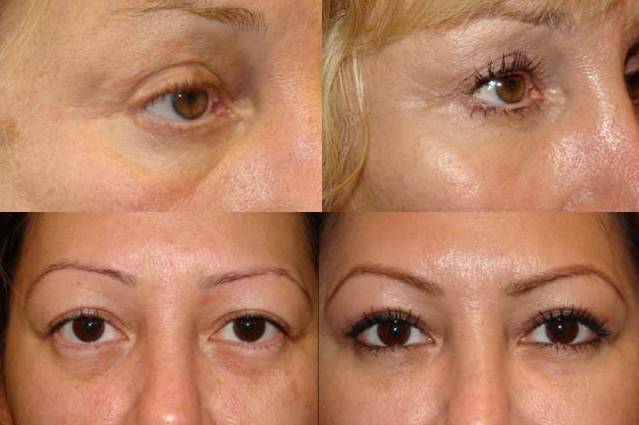 Eyelid fat transfer can consist of lower blepharoplasty (true eyelid surgery) with movement of existing eyelid fat to areas of depression (hollows). This is called eyelid fat repositioning or eyelid fat transposition. Below are examples of this procedure. Eyelid fat transfer can also consist of injecting fat from other areas of the body (abdomen or inner thighs) to the hollows of the eyelids. This is called fat grafting. Below are a few examples of this procedure. These procedures can also be combined when necessary. The area where the upper and lower lids meet is called the canthus. This area near the nose is called the medial canthus and the same area on the outer eyelids is called the lateral canthus. Webs (abnormal folds of skin) can occur in both areas and are referred to as medial and lateral canthal webs. These webs create both functional and aesthetic problems and are VERY DIFFICULT TO ELIMINATE. However, like any scar, they can be improved surgically. To correct a canthal web requires a combination of many small procedures. 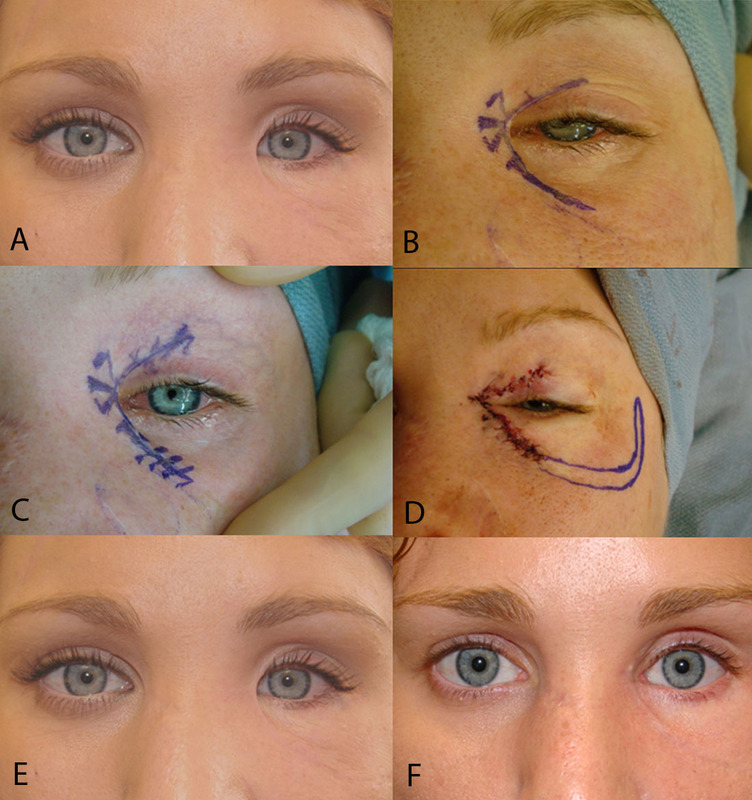 These procedures include a canthoplasty (a revision canthoplasty), and a variety of micoflap tissue rearrangements ( z-plasty, a Y-V plasty, etc). The key is to reinforce the canthus (canthoplasty or revision canthoplasty) and then move the skin around with the tissue flaps. Examples of Dr. Massry’s work can be seen on his web site above or directly at these links http://drmassry.com/#/1-3, http://drmassry.com/#/1-6 , http://drmassry.com/#/1-5 . Below is another example of a medial canthal web revision. Photos A is the preoperative presentation, photos B, C, D, are the diagrams of the markings, flaps and surgical tissue rearrangements. Photos E and F are the before and after results.